Nigeria Will Collapse If Buhari Wins 2019 – Former President Olusegun Obasanjo Makes U Turn, Disapproves Buhari’s 2nd Tenure. 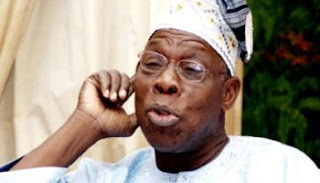 A former president of Nigeria and chairman of advisors of the Africa Initiative for Governance (AIG), Chief Olusegun Obasanjo who in his recent statement that made headlines said that he will support President Muhammadu Buhari if he bid’s to go for a second term in office. He made this statement having ditched the Peoples Democratic Party(PDP), which brought him to power for eight years, Obasanjo threw his weight behind Buhari and inevitably The All Progressive Congress (APC) came up against the PDP administration led by former president Goodluck Ebere Jonathan. But that was in the past, because in this recent brief interview by a journalist after Obasanjo delivered a speech titled “Leader In African Context” at the Blavatnik School of Government, University of Oxford on Monday. Chief Olusegun Obasanjo said in his comment that ‘Nigeria Will Collapse if Buhari wins in 2019 general elections’.